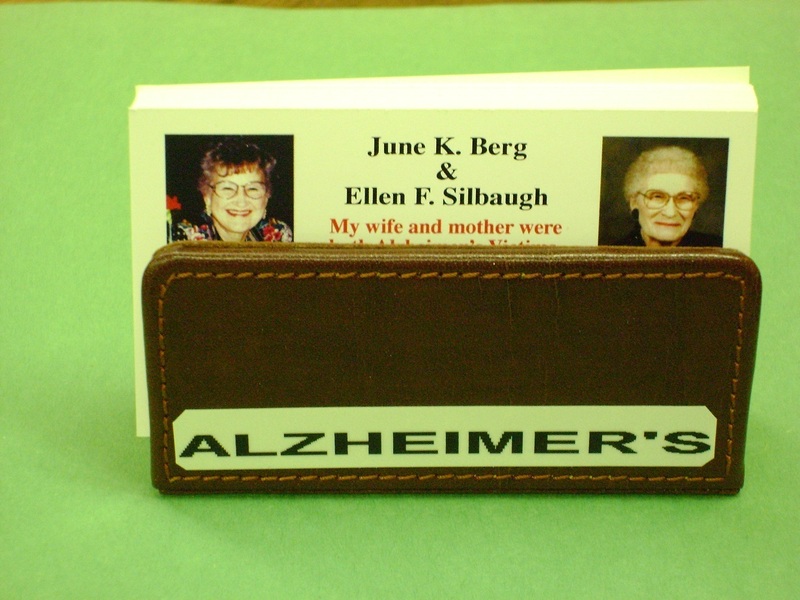 The card holders used for dispensing the "June Alzheimer's Awareness" cards (walnut wood or leather holders have dimensions of approx. 4"x2"x1". Photo of one of the leather card holders is shown above. The back of the card has statistics and data that outlines the scope of the present Alzheimer's health problem and the need for additional funding. Cards are given out at every opportunity. I also enclose a card with every monthly bill that I pay during the month. I frequently will pass out cards to waitresses and when appropriate to the nearby tables when dining out. I carry cards in my shirt pocket and will present them to anyone that I meet and talk with. I have (8) eight card holders in place on/at the front desks near the cashier's position at eight business places... seven are restaurants - "Applebee's" and Embers" in Fridley, MN, Baker's Square in Blaine, MN, "Cowboy Jacks" in New "Brighton, MN, Green Mill in Roseville, MN, Keys Cafe in Spring Lake Park, MN and "Maxine's" in Rice Lake, WI. (Rice Lake is my home town!) In addition there is a card holder/dispenser at the "Eye Care Center" in Fridley, MN. The cards are placed in a prominent location for the convenience of the patrons or customers if they desire to take a card. The card holders of walnut or leather are designed with the word "Alzheimer's" appearing in bold print on the front of the holder. * Note: The business locations that I placed June's card holders are business places that I patronize and that are friendly to doing something about Alzheimer's. While the cards distributed by this means are slow and low volume, it is a steady distribution. These are all business places that were prominent in June's life before and during her Alzheimer's journey! I usually engage in a short oral discussion when I personally present the card and welcome any further discussion of Alzheimer's, the need for funding, research and the proper care practices. I encourage a visit to June's web site for additional information and reference the 305 articles and essays to be found on June's web site. When there is a large group, in order to get their attention, a technique I have found useful is to announce that I am looking for an "Angel". This usually gets everyone's attention and it adds a light moment to the introduction of a sad and serious subject. Maybe some day I will find that "Angel." 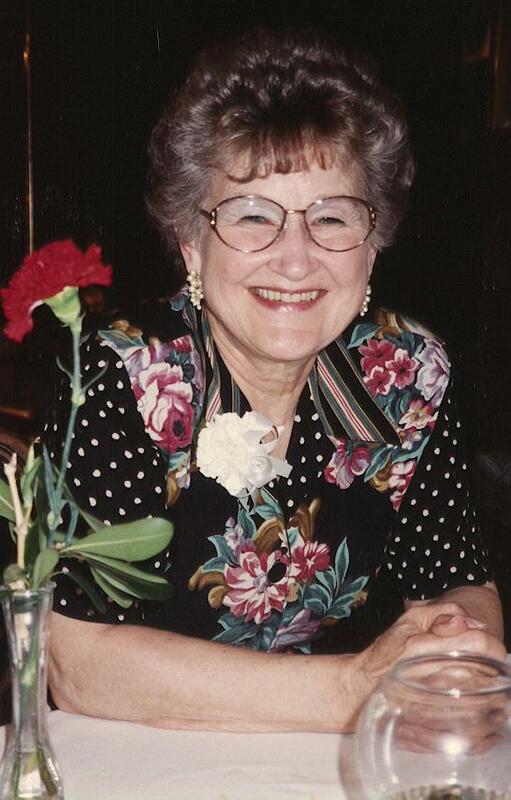 So far in my lifetime, the closest I have come to an Angel is June, who has most of the qualities of an Angel. 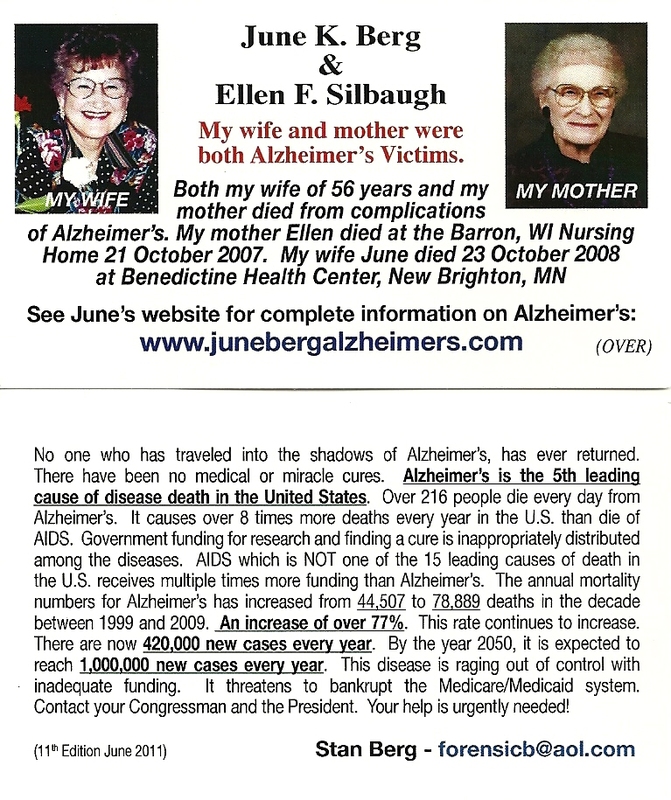 I have only been rebuffed on two occasions when I have attempted to present one of June's Alzheimer's awareness cards to a potential recipient. I usually ask the person if they utilize the internet. This approach usually results in a guarded answer with a somewhat of a suspicious look! "What is this guy trying to sell me?" 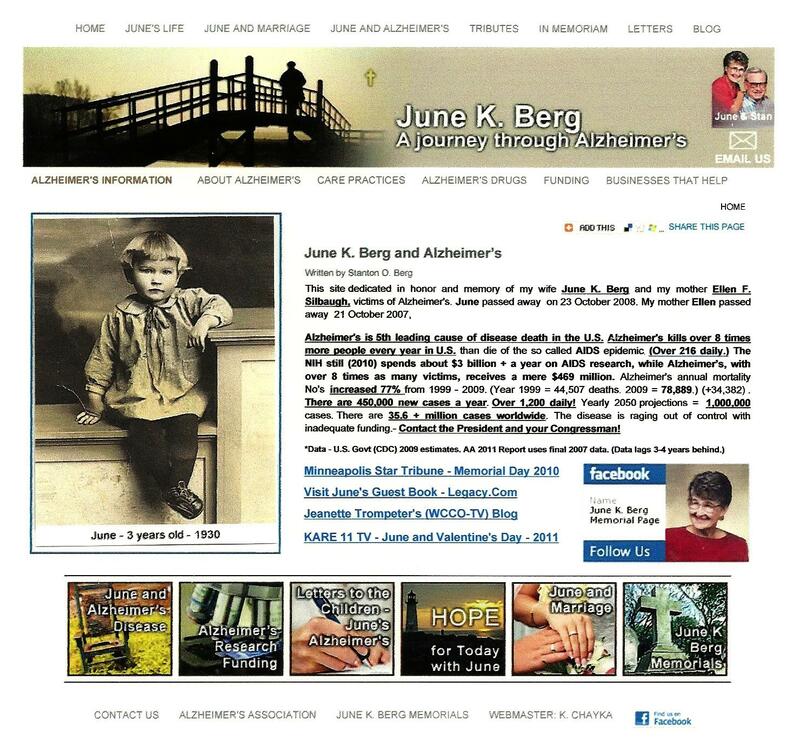 However the moment I mention that I am promoting "Alzheimer's awareness" and that both my mother and my wife died from this disease, the attitude immediately changes, and the conversation is cordial and receptive. Being 86 years of age is also helpful as I do not appear very threatening! I realize that my efforts are overall, a small volume operation in getting the word out and the cards distributed. It is my effort to personalize the disease and put a face on it. I hope that people will remember the card as distributed by this old man who lost a wife and a mother to the disease. This old guy who was looking for an "Angel". I keep thinking that maybe someday I will touch the right person and big things will happen...I might even find the Angel I am looking for to make a difference!...Maybe at that point God will say to this disease something along the line of that old saying "and thats all she wrote." I am 84 years of age with health problems. I hope that I will be around to see the day that this terrible disease is conquered. But I also realize the God may determine that for me personally, "thats all he wrote!" June and Stan were both appointed as Purple Angel World Dementia Ambassadors (October 2013) for the purpose of promoting world wide awareness of Alzheimer's and the dementia diseases. Such an awareness will in turn promote funding for research to find a cure and to promote proper care practices. June was appointed an honorary Purple Angel Ambassador with Stan as her representative in order to promote her many charitable programs that all have an Alzheimer's and dementia awareness connection. June is the only resident of Heaven to have received this honor...and who actually lives among the Heavenly Angels...The Purple Angel world headquarters is in Devon, United Kingdom.